The problem, though, is that the matchmaker is based primarily around cups. That means a BH6 game at 1200 trophies will end up matched to the BH4s that reside there and that just ain't a fair fight. The standard is for a player to fight his own BH level for a few days, then he starts seeing mostly the BH level that is one above his own. 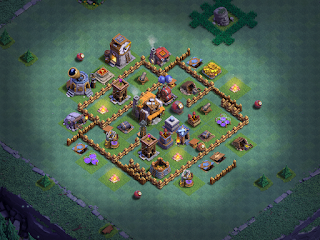 Additionally, there are a lot of players who are rushing their bases to BH5 and BH6 so fast that they have ultra weak defenses, low level troops, and don't understand well how to play the game. This leads to a very frustrating game that a lot of players are just going to delete. The forum's response is usually either "your trophies are too high" or "you need to rush to BH6". Neither of these is the right answer. If a player is stuck in the lower trophy ranges because his game has been poorly rushed, or even if he's trying to just progress steadily through BH4/BH5, he will need more wins than losses to advance through trophies and enough loot to perform basic upgrades. Case in point - a player at 1200 trophies will only make 215K in gold/elixir each day. It will take several days to get the gold and elixir necessary to put down everything new, upgrade things like storages, and upgrade the BH. There will also be time needed to upgrade the lab and work on some troops. When this player reaches BH5, the costs for these same, absolute base upgrades, will be even higher and take even longer to achieve at such a low trophy count. He'll be very frustrated getting through all this as it's just grind, no fun at all. Once he finally gets to BH6, he'll take a week or more getting the new structures placed, all the while losing battles left and right because he still has ultra weak defenses and troops that are not up to the levels needed to be successful at the game. This idea worked particularly well when the game first started because everyone was doing it. Now, though, it's not so easy. More importantly - it's frustrating. In fact, I'd call it extremely frustrating. No one wants to play a game like that and players are already dropping. This is why the matchmaker is problematic and needs some work. A player should NEVER face an opponent that is two levels further in the game. BH4 vs BH6 (and, eventually, BH5 vs BH7) is just a no-brainer loss for the underdog. Higher level bases will actually require more destruction to get a high enough percentage to place and those structures being destroyed will typically have more HP than the underdog's base. Likewise, a newly minted BHx should not be going up against near-max BHx+1 for the same reason; it's more than their offense is ready to handle. Every day, there are discussions started by different players about the problems with matchmaking. In some cases, the player simply needs to rush more strategically, get better at attacking, or just has unrealistic expectations. That does not diminish the level of complaints, however, and enough come from "Fresh Spawn" who never return as would suggest players just deleting the game and moving on.